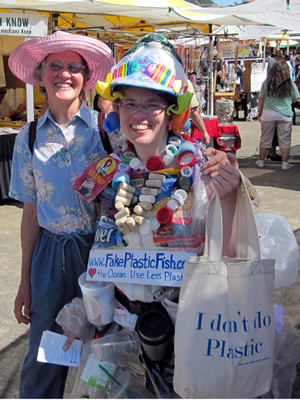 An Earth Day Post Plastics-Haters MUST READ! I like to blog about way out there plastics, like plastics from algae, and I like to write about industry trends but my favorite topic is addressing poor misguided folks who think we need to eliminate plastics from our lives. With that in mind, today's blog is dedicated to EARTH DAY! I knew it! Now I'm not against fat people, but according to the UK Sun they are selfishly causing global warming problems. They equate being fat with driving a gas guzzling SUV. The study by Dr Edwards and colleague Ian Roberts is published in the International Journal of Epidemiology. "The scientists say providing extra grub for them to guzzle adds to carbon emissions that heat up the world, melting polar ice caps, raising sea levels and killing rain forests." Should we round them all up? Unless Global Warming isn't even real, then we can leave them alone. Great blog by Doug Smock on this issue. According to the NY Times factual, scientific (cough,cough) report, Stainless is better environmentally than plastic. But they use such shoddy math and faulty logic that someone should be arrested. This is why all these poor people are confused out there. Well meaning but dumb people slant reports to say what they want, thereby causing a panic. "One stainless steel bottle is obviously much worse than one plastic bottle." But they are only comparing a reusable steel bottle to a one use throw away plastic bottle. Even by their own logic, a solid plastic reusable PLASTIC bottle will be better than STAINLESS!!! Oh, and just get a BPA free bottle to avoid that whole topic. UPDATE: Nalgene no longer sells water bottles made with Bisphenol A. Number 7 as a plastic type means any plastic that is not in the first six, so having number 7 on the bottom does not necessarily mean that it contains BPA. You know plastics in clothes HAS to be a bad thing right? Even aside from all the dicso polyester clothes jokes, right? We should all be wearing leather shoes and cotton clothes to save the world? WRONG! If everyone did that the deforestation to grow additional crops and grazing land, not to mention all of the extra animal flatulence would be FAR WORSE for the environment than some plastic in our clothes. But! Don't worry, now their is a solution: make your clothes from pet fur! Hmm, but they look really warm, maybe we won't need clothes at all, what with the global warming and all. Use a Plastic Cork, save a tree, save the globe! You think a plastic cork MUST be bad for the environment, right? Well tree huggers, what about the tree? Did you know cork is the bark of a Quercus Suber tree and that it is stripped off the living tree painfully, worse than waterboarding! And a tree's bark is its outter-wear, its protection from the elements. And worse, as soon as the bark grows back they strip it off again! Where is the compassion for these poor tortured trees? Wouldn't a little recyclable plastic be more humane than this! This tragedy is one of those points that splits the liberal crowd wide open! Which is worse, tree torture or use of a plastic? Maybe we should ask the NY TImes, they'll straighten us out. Now here is a plastic alternative I love. Replacement of Styrofoam with an plant waste based organic alternative! Yes folks, there are plastics alternatives I prefer and here's one. In every possible way this is SOO much better than Styrofoam EPS plastic. Comes from a waste source; ice hulls, corn husks, etc. Totally biodegradable. Moldable. Not Plastic! Oh look, now I've done it. I find myself in agreement with the NY Times on an issue! Ugh. The problem is not your dog lady, the problem is YOU!!! Now granted this is probably my favorite topic, plastic bags. I'm the first to be anti-litter, I hate it. I loved the Keep America Beautiful ads as a kid that featured the litter surrounded crying indian...errr...native american (sorry). As Cesar Milan, the dog whisper inevitably says, "the problem is not the dog lady, the problem is you" and so it goes with litter. All of this misguided folks blaming the plastic bag as the evil daemon without so much as a mention to the fact that PEOPLE littered those bags individually or corporately. The problem is YOU, not the bag. I'm not FOR the bag, I just strongly dislike the blame being put on the bag instead of on ourselves. Reusable bags? Way to go, all the way, nothing is better. But paper versus plastic bags? A whole essay can be written on how plastic may be environmental better than plastic. That said, you've GOT to see this anti-plastic bag video on you-tube. It's very well done and persuasive and likely the best tool the plastics haters have ever made. Check it out, for better or worse. Again, I don't like litter, but the answer is to be anti-litter, not anti-any particular material. One of the largest misconceptions is the alleged giant plastic trash island floating in the pacific. It's a bad thing, no question. My problem is the false impression that is repeatedly made. Environmentalists have made it sound like it is a giant Sargasso Sea of plastics, so big and thick that you could build on it. Other than occasional small patches that make for good photography, this plastics patch is actually widely dispersed and not an island or even a contiguous mass of plastic the size of a continent, according to what I've read. I don't like it, but I dislike the distortion and exaggeration of the story even more, and it makes me doubt everything. This image, this blog source, accompanies an article titled Garbage Island, but I'd bet anything that the photo is from a landfill, not the ocean. But the public reads it and imagines this horrific continent of plastic crap, it simply isn't accurate. And again, people are anti-plastic instead of anti-litter, not a peep about that! Note: I don't like the 'real' ocean plastic garbage patches and I'm even more disappointed by the plastics industry lack of a response to it, but hey, lets tell the truth, not lie about it to scare you. Good News! Torture no longer needed to make plastics! For Earth Day, A Public Service Announcement, Corn Based Plastics For Kids! Here you go folks, guilt free plastics made from corn. Includes kids eating plates and utensils as well as pacifiers and toys! Oh, there is one problem. Making plastics from food crops has big issues down the road as plastics would compete with hungry people for the source material. Better still to make it out of tortured bacteria or gently nano-milked algae so we can have our cake and eat it too! Plastics, use less or use it better? Plastic can now be easily turned back into oil rather than landfill it. Recently, I've seen two announcements on it, one from a Japanese technology developer, and one from a recycler in Washington state using a US based technology. and for my friends in the plastics industry..